SoulCalibur 5's lackluster single-player offerings majorly stuck in my craw when I reviewed it last January, and while the game's combat is primarily excellent, I couldn't overlook the fact that its story mode is, as I said in my review, "a 3-hour hodgepodge of indecipherable, confusing storyboard panels punctuated by random (although admittedly gorgeous) cinematics." 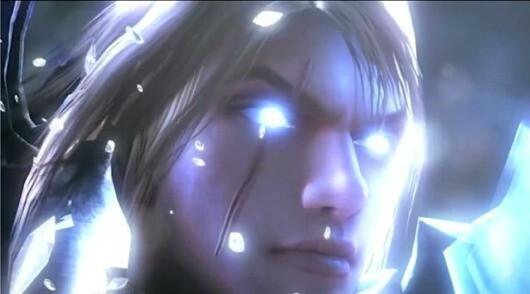 As it turns out, I wasn't the only one who wanted more from the game's story mode: "Our first plan on the storyboard was that we had every characters' story, and actually we do have it in the studio, but time-wise, man power-wise we weren't able to do it and only one fourth of what we planned to do is in the game," said SC5 director Daishi Odashima during an interview with Train2Game. In its current form, SC5's story mode follows the adventures of Sophitia's children Pyrrha and Patrokolos. Similar story modes would have existed for every character, but developmental restrictions prevented that from happening. Voice overs for some characters' canned stories exist in a finished, usable state, but Namco Bandai currently has no plans for how (or if) they'll ever be used. SoulCalibur 5's story mode is one-fourth its originally planned size originally appeared on Joystiq on Sat, 31 Mar 2012 18:30:00 EST. Please see our terms for use of feeds. A motion filed by EA to dismiss a class-action lawsuit filed against it by 6,000 retired NFL players has failed, reports Gamasutra. As you'll recall, the players that filed the suit claimed that their likenesses were used in Madden 09 without permission or compensation. While the player's names and numbers were changed, vital and identifiable statistics were left unchanged. Rather than argue that it in fact didn't replicate real-world players without authorization, EA's motion to dismiss postulated that Madden 09's use of player likenesses was covered by the First Amendment, and therefore did not require consent or compensation. Since this motion was denied, the case will move on to court. Plaintiffs are seeking legal fees, damages and all profits generated through the use of said plaintiffs' likenesses. 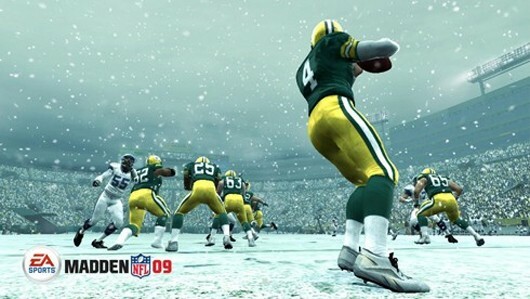 Game on: NFL likeness lawsuit against EA moving forward originally appeared on Joystiq on Sat, 31 Mar 2012 14:00:00 EST. Please see our terms for use of feeds. The PlayStation Vita continues to drop in sales due to the lack of new software and its sales is just 36 percent of its main rival, the 3DS. The 3DS is the big winner week on week as its sales are up nearly 40,000. Year on year sales don’t look so good with every platform being down. However the 3DS did launch in Europe exactly one year ago. Overall sales are up by one percent week on week and down 40 percent year on year. Overall six games debuted in the top 30 this week. Resident Evil: Operation Raccoon City sold a combined 577,127 copies in its opening week. Software milestones this week in the top 30: Mass Effect 3 (X360) passed the two million mark. Week on week sales are up for the Wii, 3DS and PSP. The 3DS is at the top this week with sales of 210,514 units, which is up 37,759 (22%). The PlayStation 3 is down 13,667 (-9%) to 147,065 units sold. Xbox 360 sales are down 6,899 (-6%) to 109,437 units sold. The Wii sold 767,308 units, which is up 1,188 (2%). The PlayStation Vita is down 14,026 (-15%) to 77,244 units sold. The PSP sold 43,792 units, which is up 332 (1%) compared to last week. The DS is down 992 (-3%) to 29,193 units sold. Total week on week sales are up 3,695 (1%) to 694,553. Year on year sales are down for every platform, except for the 3DS. The PlayStation 3 is down 30,544 (-16%), the Wii is down 64,955 (-46%), and the Xbox 360 is down 35,539 (-23%). The PSP is down 62,636 (-59%) the DS is down 154,368 (-82%) and the 3DS is up 109,397. With the Vita and PSP combined it is up 28,997 compared to the PSP one year ago. Total year on year sales are down 147,012 (-17%). 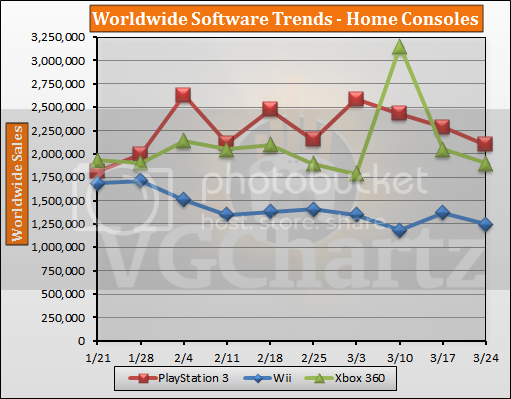 The PlayStation 3 and Xbox 360 have dropped in sales for a fourth straight week, while Wii sales have stabilized. The PlayStation 3 has a 44 percent market share; the Xbox 360 has a 33 percent market share; and the Wii has a 23 percent market share. The PlayStation 3 is in first for a 13th straight week. Compared with ten weeks ago all three home consoles are down. The 3DS has outsold its predecessor, the DS, by more than 7 to 1 and the Vita has outsold its predecessor, the PSP, by nearly 2 to 1. The PSP has a 60 percent market share this week for the current generation handhelds and the DS has a 4 percent. The 3DS has a 73 percent market share for the next generation of handhelds, while the Vita has a 27 percent market share. 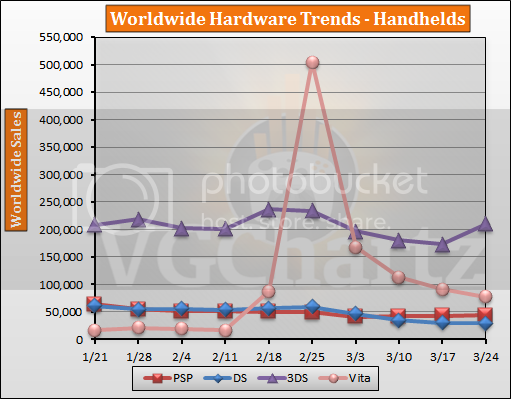 Compared with ten weeks ago the Vita and 3DS are up, while the DS and PSP are down. Six games debuted in the top 30 this week. Resident Evil: Operation Raccoon City (X360) debuted at number one with sales of 290,922. The PlayStation 3 version debuted at number two with sales of 286,205. The game launched in North America and Europe and will be in the following weeks chart for Japan. Kid Icarus: Uprising (3DS) debuted at number three with sales of 240,967. The game launched worldwide. Kurohyou 2: Ryu ga Gotoku Ashura Hen (PSP) debuted at number six with sales of 104,997. The game launched in Japan with no plans to be released elsewhere. Ninja Gaiden 3 (PS3) debuted at number 13 with sales of 66,703. The Xbox 360 version debuted at number 24 with sales of 35,672. The game launched worldwide. Devil May Cry HD Collection (PS3) debuted at number 19 with sales of 44,221. The game launched in Japan, and launches on April 3 in North America and Europe. Silent Hill HD Collection (PS3) debuted at number 28 with sales of 34,033. The game launched in North America, and will be in the following weeks chart for Japan. Other games in the top 10 that are not debuts include Mass Effect 3 (X360) at number four with sales of 165,734. FIFA Street (PS3) is at number five with sales of 111,434. FIFA Street (X360) is at number seven with sales of 89,363. Just Dance 3 (Wii) is at number eight with sales of 88,847. Call of Duty: Modern Warfare 3 (X360) is at number nine with sales of 77,634. Mario Party 9 (Wii) is at number three with sales of 76,091. Week on week software totals is down for every platform, except for the 3DS. The PlayStation 3 takes the top spot this week with sales of 2.10 million, a decrease of 190,706 (-8%). The Xbox 360 sold 1.90 million games this week, a decrease of 150,110 (-7%). Wii software sales are down 121,462 (-9%) to 1.25 million. The 3DS sold 625,747 games, an increase of 205,906 (46%). The DS sold 603,695 games, which is down 159,979 (-21%). PSP game sales are down 63,870 (-13%) to 409,891 games sold. The Vita sold 124,584 games, a decrease of 23,438 (-16%). 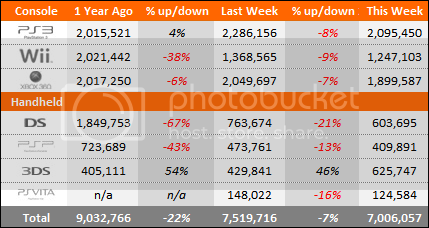 Total combined software is down 513,659 (-7%) week on week to 7.50 million. Year on year software totals are up for the PlayStation 3 and 3DS, and are down for the Wii, Xbox 360, PSP, and DS. The PlayStation 3 is up 79,929 (4%), the Wii is down 225,661 (-38%) and the Xbox 360 is down 117,663 (-6%). 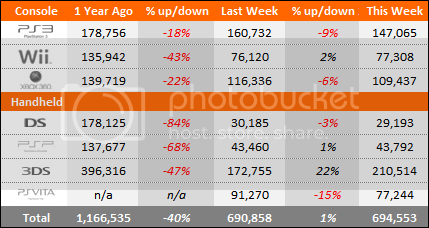 The DS is down 1.25 million (-67%), the PSP is down 313,798(-43%) and the 3DS is up 220,636 (54%). Total combined software is down 2.03 million (-22%) games sold year on year. The PlayStation 3 sold the most games this week and has lead for eight of the last 10 weeks. The Xbox 360 led for the other two weeks. The PlayStation 3 has a 40 percent market share, the Xbox 360 with 36 percent, and the Wii with 24 percent. 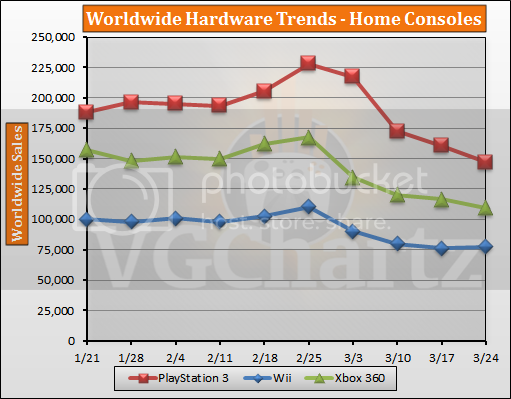 Compared to ten weeks ago the PlayStation 3 is up and the Xbox 360 and Wii are down. The 3DS is back above the DS and the PSP remains above the Vita. The DS has a 60 percent market share for the current generation handhelds and the PSP has a 40 percent market share. The 3DS has a 83 percent market share for the next generation handhelds, while the Vita has a 17 percent market share. 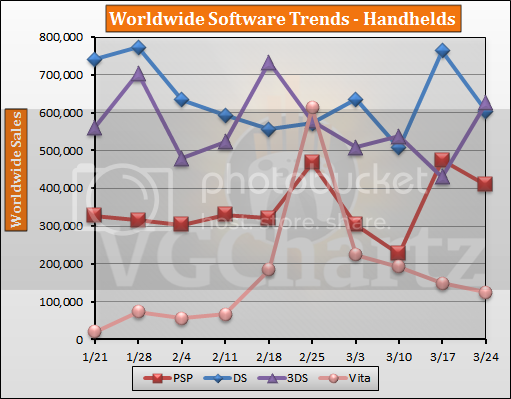 Compared with ten weeks ago the Vita, PSP and 3Ds are up, while the DS is down. The Top 50 can be seen below or click here to view the full chart. "XboxFL" actually stands for "Xbox Football League." The service will be a browser-based fantasy football simulator with heavy integration into both the console and Windows Phone versions of Xbox Live. Alternatively, "FL" could stand for "Featured Losers," which would mean that XboxFL.com is an embarrassing hall of shame for Xbox Live users that performed far, far below average in that week's most popular games. 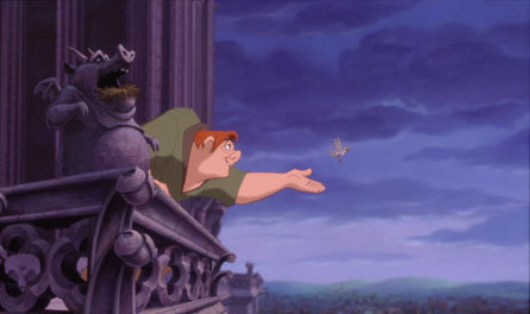 Avatars are bound to wheels, Hunchback of Notre Dame style, while site visitors play sponsored flash games to pelt them with rotten fruits and dead rodents. Rampant Speculation Theatre presents: Microsoft registers XboxFL.com originally appeared on Joystiq on Sat, 31 Mar 2012 10:40:00 EST. Please see our terms for use of feeds. Ah Pictionary. Now there is a party game. You pick some teams, pull out an egg timer and a comically large drawing pad, and test your art skills against the guessing skills of your teammates. Yet often a round of Pictionary is merely a precursor to a yelling match. There is a score, a time limit, and the self-important eyes of the opposing team when your partner keeps guessing bird when you have so obviously drawn a banana! No, I still haven’t forgiven you, person who shall remain nameless. Anyway, wouldn’t it be great if someone got rid of all that? You know… if they made a version of Pictionary that didn’t have a score or a time limit, that you could play without someone’s judgmental eyes leering at you while you draw. Well that is exactly what you get with the latest OMGPOP iOS/Android game, Draw Something. There is no story to uncover, no leaderboards to climb to the top of, there is only art and friendship. You begin a game by picking someone (more on that in a minute), selecting a word, and then drawing a picture of that word for the person to guess. They will then see your drawing, be able to guess the word, and then they will be able to send you a drawing of their own for you to guess. It sort of feels like digital painting ping pong. Drawing is as easy as finger painting. You have colors you can select along the top and four different brush sizes to choose along the bottom. There is no time limit, so you can take as much time as you want getting your drawing exactly the way you want it before sending it off. In an inspired move, the person guessing gets to watch the drawing unfold, brushstroke by brushstroke, allowing them to guess the word at anytime. Clever players will take advantage of this fact by slightly animating their drawings; if you get in a game with a good digital artist, it almost feels like watching a painting being created on your device. You don’t get to choose any word you want to draw. The game will offer you three words to choose from. These words are arranged so that the easiest word will win you a single (in-game) coin while the hardest word will get you three. The hard words are either longer words or something that might be more difficult to communicate through pictures, like proper nouns. No matter which word you select, the person guessing will have twelve letters to choose from total, so they aren’t left in the dark for too long. There are no true fail states, as you can continue to guess until you get it correct. You can use in-game coins (which you earn through correct guesses or can be bought through microtransactions) to purchase bombs which will remove most of the unnecessary letters. Bombs can also (and more wisely) be used to get another batch of three words to select from when making a drawing. For my virtual money, additional color packs are the way to go. You start the game with only black and the three primary colors. Ok, five colors if you count the eraser tool as white. While you could technically play the whole game with just these colors forever, adding more colors just adds to the fun. With lots of games going on, and focusing on the three-coin words, you can soon have quite a sizable chromatic collection. Plus, buying the premium ad-free version (typically $1.99, but often on sale for half that) will give you a few more thousand words in the "word bank" and a starting bank with enough coins to get another color pack right off the bat. The main draw (accidental pun!) of this game is the cooperative social aspect. It's in your best interests to keep the game going by drawing the clue well enough for the other person to guess, because a correct guess earns both people coins. OMGPOP wisely designed this game to not only connect you to people through Facebook but also be able to function cross-platform. Android players can play a game with iPad/iPhone owners and vice versa. There is the option to play against a random person, but it is much more enjoyable to play with family and friends. For example, once I had the word ‘bat’ to draw. I could have drawn the animal, or drawn a wooden bat next to a baseball… instead I chose to draw Batman and then wrote ‘- man’ next to him. It could be because I’m an art major and know how to draw, it could be because I happen to own a stylus for my iPhone, but really it was just because I knew that the person I was drawing it for was a nerd like me and would get a kick out of it. This could also become the game’s greatest flaw. It's 100% multiplayer dependant. You only have as much fun as the person you're playing against is putting into it. Without an end point to the matches, or a chance of failing, there will come a time when the whole thing gets stale. At this point in time, it's just sort of like texting your friends with pictures. Still, for the price, a lot of fun can be had communicating through pictures instead of words. It's almost the ideal mobile game; easy enough for anybody to play, flexible enough to allow talented artists to show off a little, quick enough to play for two minutes, fun enough to hold your attention for a few hours. This review is based on the 1.4.1 premium version of Draw Something for the iPhone. 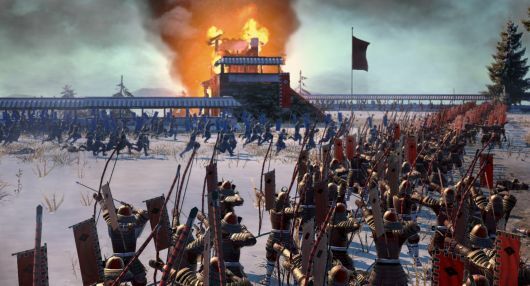 Creative Assembly's Mike Simpson says the popular Total War series of strategy games wouldn't work on the current console generation, just in terms of hardware requirements. "They don't have enough memory, by a large factor," Simpson tells Eurogamer. The audience for console games tends to be a little more action-oriented and a little less strategy focused, and the experiences are very different as well, he asserts. But there's hope yet, "for all sorts of reasons." The user interface is another issue, according to Simpson, but it's fixable through solid game design. While he doesn't mention the Total War version coming to iOS, that's definitely a clear indicator that the game can work on platforms other than PC. And Simpson says that despite the differences, Creative Assembly has some "very clever ideas" on adapting its popular strategy games for the next wave of consoles and the pick-up-and-play style that go along with them. Current gen consoles 'can't cope' with traditional Total War originally appeared on Joystiq on Sat, 31 Mar 2012 02:30:00 EST. Please see our terms for use of feeds. EMI Music Group has filed a suit against Def Jam Rapstar creators 4mm Games and Terminal Reality, claiming the game contains unlicensed tracks from Kanye West, Lil Wayne, DMX and more, and uses unlicensed compositions from DJ Khaled, MIMS and Daft Punk. According to statements given to The Hollywood Reporter, EMI demanded royalties from the game makers but never received a response. EMI is looking for compensation on 54 songs from Def Jam Rapstar's total tracklist, and with EMI looking for upwards of $150,000 for each "infringement" that total tab is looking mighty steep. In the worst case, that brings us to total of $8.1 million. 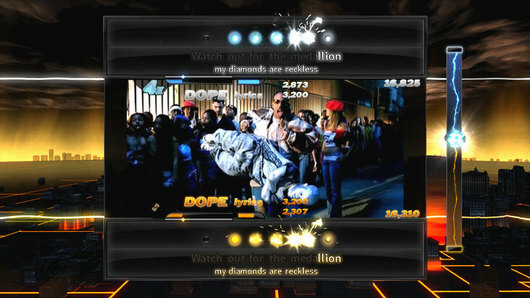 The karaoke aspect of Def Jam Rapstar, and its online video-sharing capabilities, also make this dispute trickier, since EMI owns the rights to display, publicly perform and distribute these songs. Please excuse us while we try to get Richard a good lawyer in case EMI targets us next. EMI sues Def Jam Rapstar creators originally appeared on Joystiq on Sat, 31 Mar 2012 01:30:00 EST. Please see our terms for use of feeds. Time to get those goth-rock glamour gowns out of storage, because next week's Rock Band DLC features the emotional tunes of Evanescence. Vocalists should be prepared to warm up at least 15-20 minutes before attempting any type of Amy Lee belting. Rock Band Weekly: Evanescence originally appeared on Joystiq on Fri, 30 Mar 2012 23:30:00 EST. Please see our terms for use of feeds. A bevy of problems ensures that South Park: Tenorman's Revenge is a tedious ordeal even for those who love the television show.